Bishop Barry Knestout grew up in a Catholic home, as one of nine children (3 girls, 6 boys), to the late Deacon Thomas and Caroline Knestout. His father worked for a national security agency. Barry recalls that growing up, his family always prayed. “Family prayer was in the context of meals — prayer around the table at every meal, and outside of that it was all connected with the Church’s prayer and my father’s personal prayer life.” Bishop Knestout also shares, “I have a devotion to the Holy Spirit that goes back to my father’s participation in the Charismatic Renewal and his transformation of his own spiritual life. It was dramatic and beautiful and had an effect on our family.” After high school, he got a degree in architecture but during his sophomore year, he felt the calling to the priesthood. “My discernment went forward in fits and starts through college,” the Bishop said. 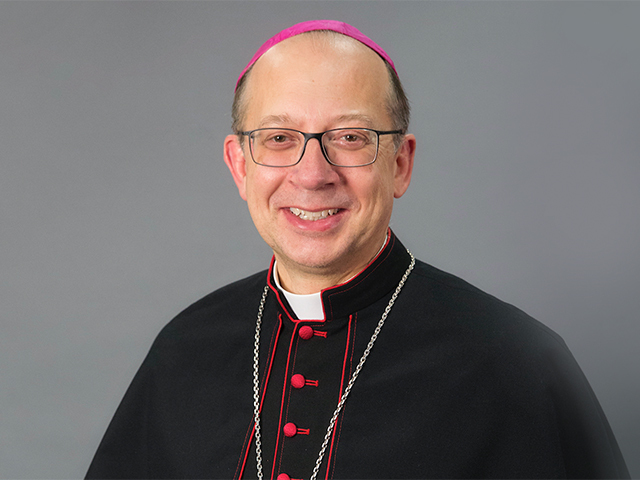 “When I completed my degree, it seemed the right time to fully test the call and I applied and was accepted into formation for the Archdiocese of Washington.” After serving in the ministry for two decades, Pope Francis named him the 13th Bishop of the Diocese of Richmond in December 2017 which encompasses the southern part of Virginia—including the Eastern Shore. These 36,000 square miles include 220,000 active Catholics in 149 parishes. In 2017, Catholic Bishops in the United States came together for an historic leader’s conference in order to create a paradigm shift from focusing on “maintenance and administration” to “missionary and evangelization” as the renewed focus for all Catholic parishes. With this call to Missionary Discipleship empowered by the Holy Spirit the Church is doing their part of help fulfill the Great Commission (Matthew 28:19-20). Pope Francis explains, “I hope that all communities will devote the necessary effort of advancing along the path of pastoral and missionary conversion which cannot leave things as they presently are. ‘Mere administration’ can no longer be enough. Throughout the world, let us be ‘permanently in a state of mission.’” They call this renewed vision “The New Evangelization.” This pastoral plan centers around four elements: Encounter (leading people to an encounter with Christ), Accompany (discipleship), Community (inviting others to the Church), and to Send (sending out missionaries). Bishop Knestout says, “That the New Evangelization involves reflecting Christ's presence by what we say, and what we do, by the living of our faith. Rather than being a new project or program, the New Evangelization is a lens through which we see everything we do.” Therefore, the focus is two-fold: Focusing on holiness first (our relationship with Christ) and then going out to the peripheries to bring the love of God to everyone. Personally, Bishop Knestout is doing that by visiting those in his massive area of Southern Virginia. After his installation, he immediately began the process of going out to meet those in his diocese, face-to-face, which covers 36,000 square miles of territory. Christ sends His followers out as missionaries, empowered by the Holy Spirit, to bring God’s love, hope, and charity. Pope Francis says, “The Church needs perennial Pentecost, the Holy Spirit’s fire in her heart, words on her lips, and prophecy in her outlook… The Church needs to rediscover the eagerness, the taste and the certainty of the truth that is hers.” The Church can transform the world with the power of the Holy Spirit! CALLING TO PRIESTHOOD Bishop Barry Knestout grew up in a Catholic home, as one of nine children (3 girls, 6 boys), to the late Deacon Thomas and Caroline Knestout. His father worked for a national security agency.